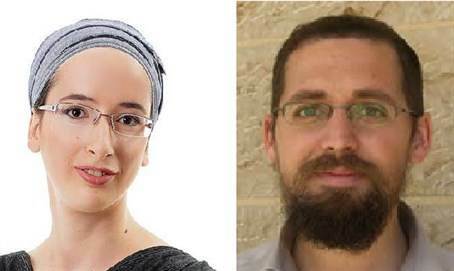 Oct 1, 2015 - Naama Henkin, 30, and her husband Eitam, of Neria, parents of four, were killed in a drive-by shooting attack on the road between Itamar and Elon Moreh in Samaria. Rabbi Eitam Henkin and his wife Naama were driving home from a reunion of yeshiva graduates, with four of their children in the back seat. At least two terrorists targeted the vehicle as the Henkins drove past the Arab village of Beit Furik. Both parents suffered multiple gunshot wounds to their upper bodies and were pronounced dead at the scene. Four of their children - 4-month-old baby, and four-year-old, seven-year-old and nine-year-old boys - were rescued from the vehicle and were taken with light injuries to a nearby medical center. A group affiliated with the Fatah Al-Aqsa Martyrs' Brigades claimed responsibility for the attack. A Hamas spokesman praised the attack by the "brave resistance," calling the murderous act "heroic". Naama grew up in Peduel, in Samaria. She graduated from the Emunah College of Art and Design and received a B.A. from the Open University. A graphic artist who owned her own studio, she provided quality, cutting-edge design services to prestigious institutions throughout Israel. Last year she posted on a "mommy forum" asking whether in light of violence in the West Bank young mothers should purchase life insurance and draft a will. A neighbor described them as "a dream couple, who in life and in death were inseparable. Everyone knew that they went everywhere together. they invested a lot in their relationship, in their family, their children. They were something special, good people, very humble." Naama Henkin and her husband Eitam were buried in the Givat Shaul cemetery in Jerusalem. Naama is survived by his parents Yehudah and Chana, siblings and children - four sons: Matan Hillel, 9, Nitzan Yitzhak, 7, Neta Eliezer, 4 and Itamar, 4 months.